Our Cookbook Education Spaces has undergone a true update, especially the chapters about Typologies and Requirements. This version 2.0 builds forth on earlier versions 1.0 (valid until February 2017) and 1.1 (valid until April 2018). Gained insights, lessons learned, and experiences with architects and builders were added to refine design guidelines and to sharpen the used definitions. 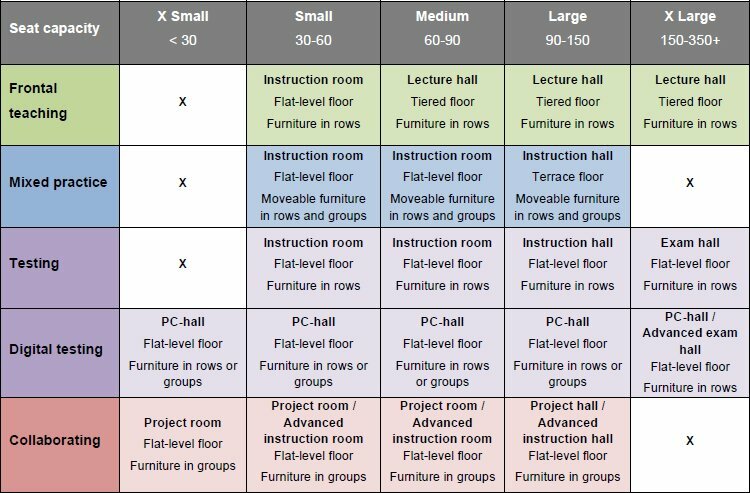 The Cookbook Education Spaces version 2.0 describes requirements for lecture halls, classrooms and study workplaces at our Delft University of Technology and contains four generic chapters: A) Pedagogic Classification, B) Education Space Typologies, C) Education Space Requirements, and D) Study Workplaces. It has been drawn up in close co-operation with teaching staff, students and supporting staff. 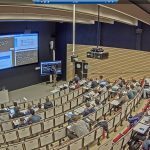 This interview about AV growth and standards is to be found at AVIXA (https://www.avixa.org/insight/Articles/Details/growth-and-standards-at-delft-university). AVIXA is the Audiovisual and Integrated Experience Association, producer of InfoComm trade shows around the world, co-owner of Integrated Systems Europe, and the international trade association representing the audiovisual industry. Established in 1939, AVIXA has more than 5,400 members, including manufacturers, systems integrators, dealers and distributors, consultants, programmers, rental and staging companies, technology managers, IT professionals, content producers, and multimedia professionals from more than 80 countries. AVIXA members create integrated AV experiences that deliver outcomes. AVIXA is a hub for professional collaboration, information, and community, and the leading resource for AV standards, certification, training, market intelligence and thought leadership. We have refurbished 65 teaching and learning spaces since the first version of Cookbook Education Spaces (Feb 2016). Gained findings have made us considering new and wider aspects, e.g. descriptions that were unclear to builders and addition of informal learning spaces. On our way to an expanded version 2.0 we have put our findings in a transient version 1.1. InfoComm has been publishing standards based on thumbrules and scientific foundations (ANSI/Infocomm 5M-2012). Still a simple tool would be helpful for the need of many. 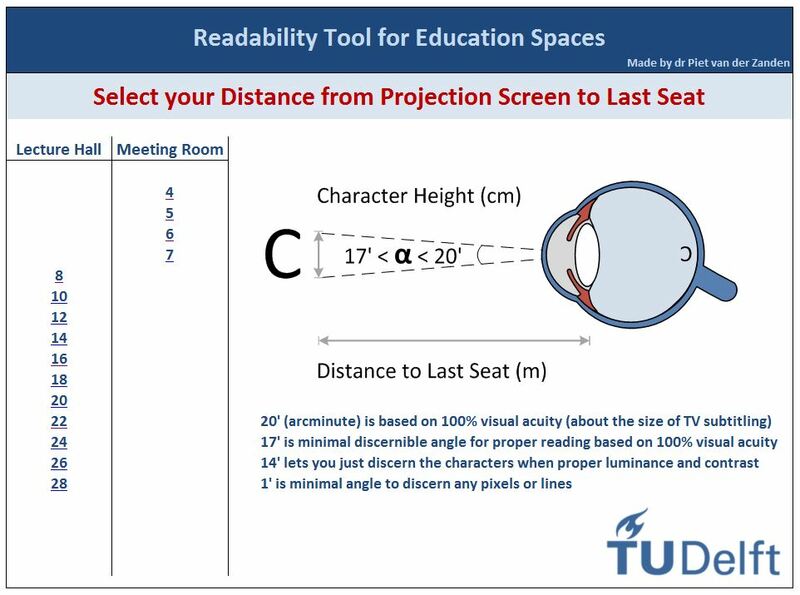 This Readability Tool for Education Spaces is based both on scientific figures and empirical observations, on top of that, it is easy :-). 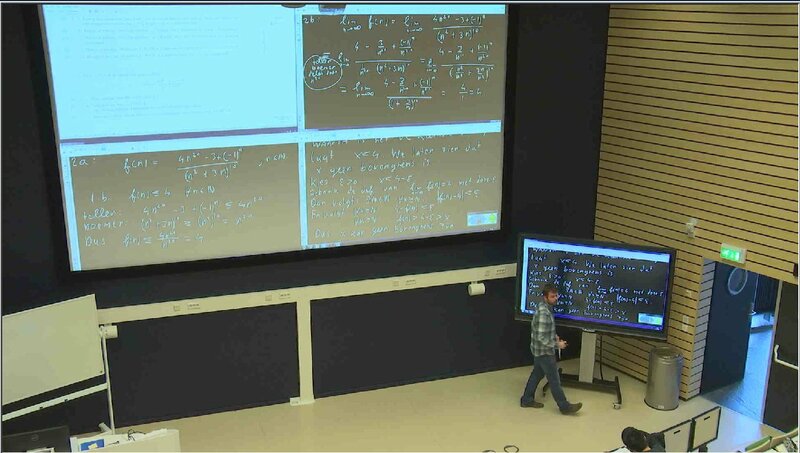 Chalkboard pedagogy is still going strong within higher education. It makes students clear how reasoning takes place instead of just presenting facts. The instructor simultaneously produce and write arguments in successive order on the board while thinking aloud. This it to visualise the reasoning, students see the process and structure of the step-by-step arguments to recognise patterns and interconnections. At the same time such talking-writing pedagogy loses connection with the contemporary but pressing movement of Open & Online education practices. The direct consequence of online practices is that all is becoming digital. Also the chalkboard should be digitised to build a bridge between campus classes, blended settings and online practices. 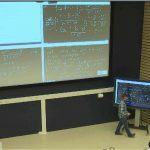 In 2012 an advanced teaching system was introduced combining virtual chalk and four parallel video signals, see earlier post on this weblog on April 17, 2014 ‘Advanced Teaching with Virtual Chalk and Four Parallel Video Signals’. Students and instructors were extremely positive, but had their opinions led to better study performances? Now, four years after initiation, study results of three full academic years were analysed and have been delivering interesting results. If we compare our findings with the largest and most comprehensive meta-analysis about undergraduate STEM education , which questions the traditional lecturing practice, we have found very competing figures. Although four-quadrant pedagogy is new, it still belongs to what is named lecture setting. How interesting would it be when active elements are added to the four-quadrant pedagogy. Read this paper and be astounded. Freeman, S., et al. (2014). “Active Learning increases student performance in science, engineering, and mathematics.” PNAS 111(23): 6. 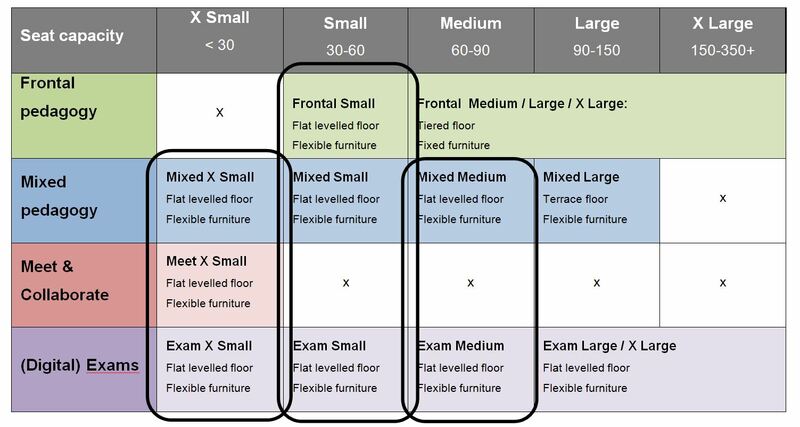 A) Pedagogic Classification, B) Education Space Typologies, and C) Education Space Requirements. 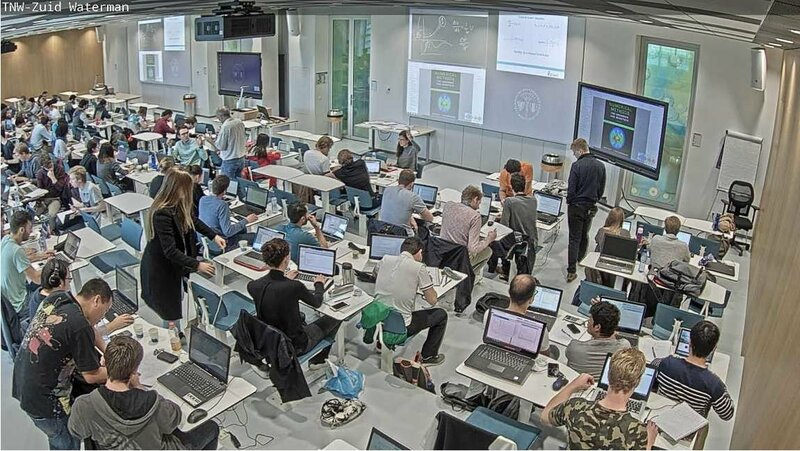 The Cookbook Education Spaces TU Delft has been drawn up in close co-operation with teaching staff, students and supporting staff. It provides an overview of education space typologies and its pedagogy for both teaching and learning environments, it presents guidelines for standardisation, operation and usability, and it is offered as checklist for designers and other project parties. Additional chapters, which are not published openly, shall contain more specific and location-bound documentation, such as space allocation, AV-IT installation specs, functional and wire diagrams, etc. Contemporary literature is all about flexible and active learning spaces facilitated with modern technologies. 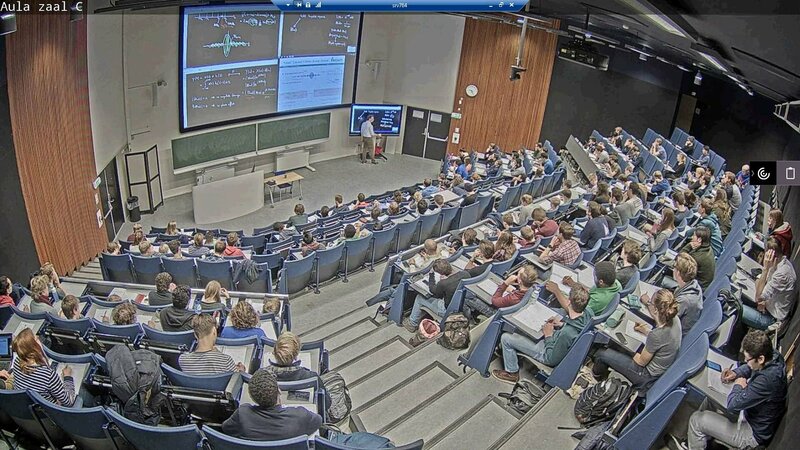 The long standing lecture hall with its frontal pedagogy is still going strong, but in dispute. 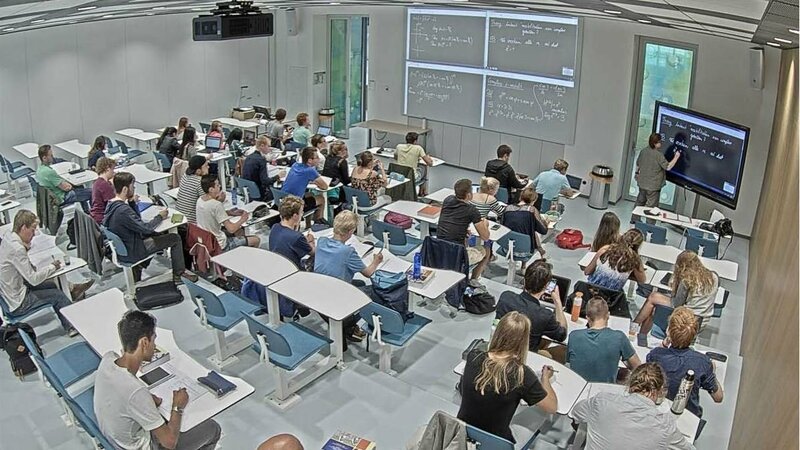 At our university the chalkboard is favourite for scientific classes, hence about seventy percent of our lecture halls and classrooms hold one or more chalkboards. You may find additional descriptions and argumentation within this paper. 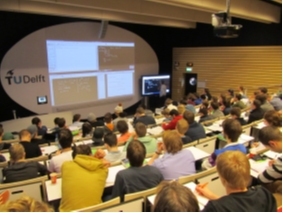 Divergent legacy systems, mass education and developments such as blended practices and flipped classrooms have confronted Delft University of Technology with a situation that curricula are to be converted into active education practices but in outdated teaching and learning spaces. Our university was urged to start streamlining the current lecture halls and classrooms in order to facilitate education practices of tomorrow while maintaining to support those of today. The workgroup Transforming Education Spaces is charged with classifying the required education spaces, with designing its appropriate affordances, with composing a Cookbook Education Spaces and with proposing a planning for the coming five years to transform the current situation. Pictograms that indicate Teaching and Learning Space with its Affordances. The paper “Transforming Education Spaces to Sustain Pedagogical Change” was presented at the ninth edition of the INTED (International Technology, Education and Development Conference). 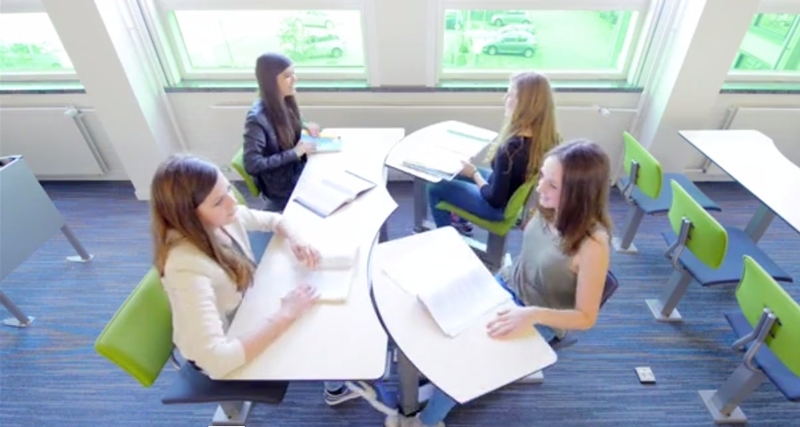 It describes how the Cookbook Educational Spaces came into existence, which content is addressed and how multiple disciplines of pedagogy, interior design, construction, infrastructure, AV-IT and ergonomics have been working together. I have read lots of literature for my PhD. Many books and papers delivered pieces for a greater puzzle that have set itself into my mind. Only after restructuring the multiple chapters and sections of my thesis at the time, this puzzle became outlined on paper. 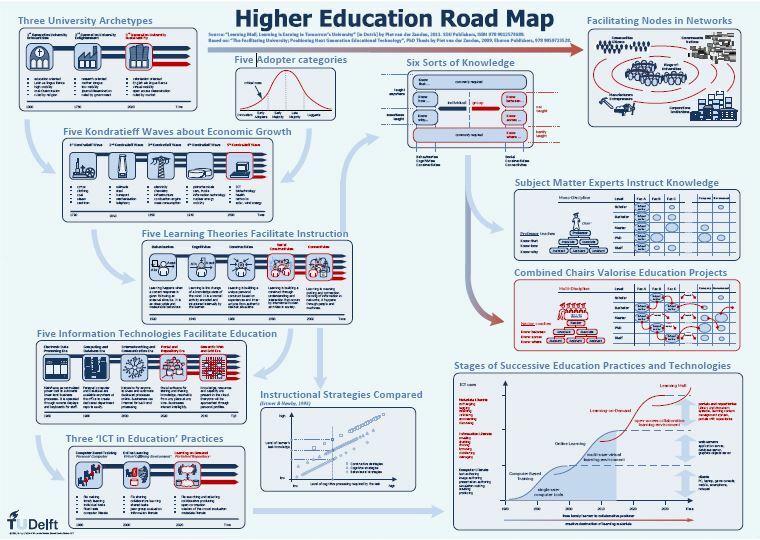 Today, I still use parts of it in discussions and presentations, which gives me hold to where we stand within higher education. 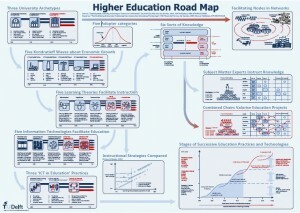 Since the last decade interactive classes and flipped classroom pedagogies came into higher education. These pedagogies prefer convertible settings, i.e. frontal instruction and group work within a single space. Easy change of tables and seats and especially preventing messy arrangements in the classroom were challenges for an industrial design master assignment. A first prototype was designed in 2010 by master student Timo van de Kreke in cooperation with manufacturer EromesMarko in the Netherlands. Two years later the prototype was converted into a null series with two possible models for further evaluation. Meanwhile several improvements have been made for the 2014 production series. 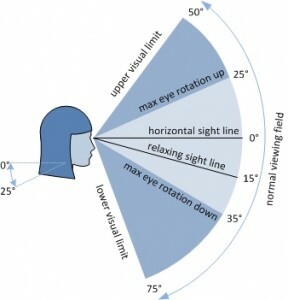 Developments are described in more detail in this paper. 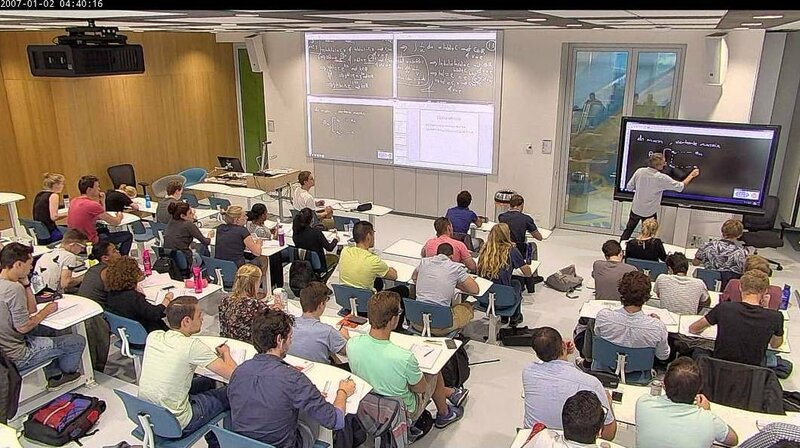 It should be compulsory that written and presented information in classrooms and lecture halls is easy to produce by the lecturer and easy to read and follow by students. 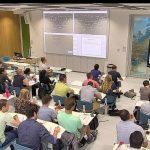 It may be of no difference for readability that written or presented texts are projected on dry eraser boards, on projection screens or on electronic displays. 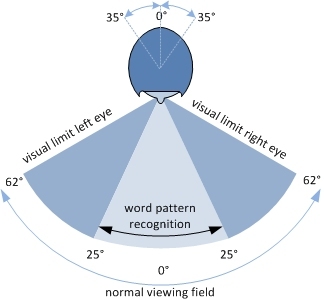 Readability of written and presented characters in lecture halls and classrooms is dependent on sight lines, reading distance, character heights, viewing angles, displays, screens and lighting. This paper describes guidelines from out of ergonomic, didactic and audio-visual perspectives for an improved readability in lecture halls and classrooms. It ought to be conducive to the building plans used to construct new education spaces or when renovating lecture halls and classrooms. 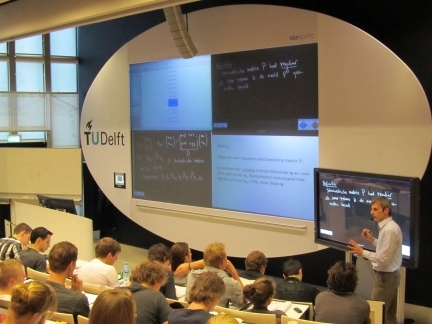 At Delft University of Technology a pilot scheme has been launched in April 2012 to introduce more advanced technological tools for teaching mathematics and other technical-scientific subjects. 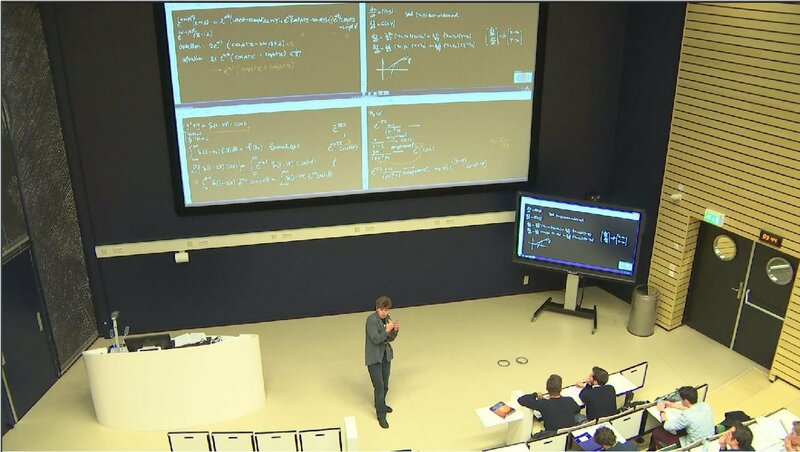 A virtual chalkboard was integrated with an Audio-Visual Information Technology (AV-IT) facility to present four video signals simultaneously. These video signals are for example PowerPoint, virtual chalkboard instances, PDF documents, Internet Explorer or video clips. 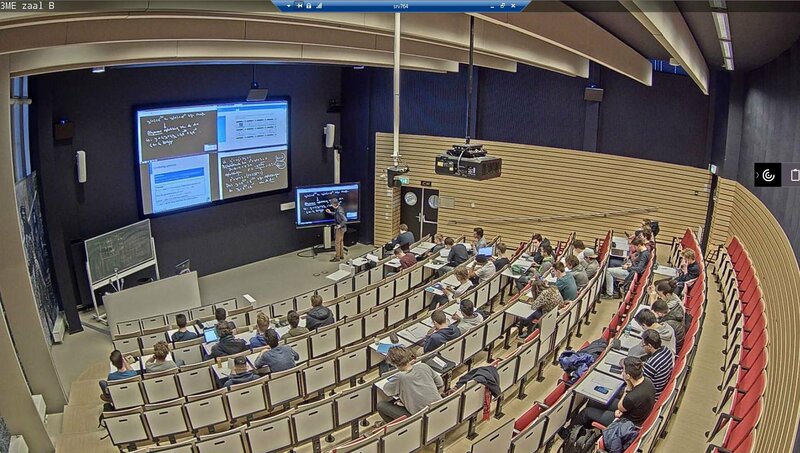 Students watch all video signals at once to get a comprehensive overview of the method being taught. In spring 2013 I have presented the paper “Advanced Teaching with Four Parallel Video Signals” at the 7th International Technology, Education and Development Conference in Valencia in Spain. It was based on early experiences. Meanwhile a total of eight evaluation periods have been taken place. Hence I have been revising and expanding the paper, which describes the collected results of 457 completed questionnaires and 238 students’ comments. 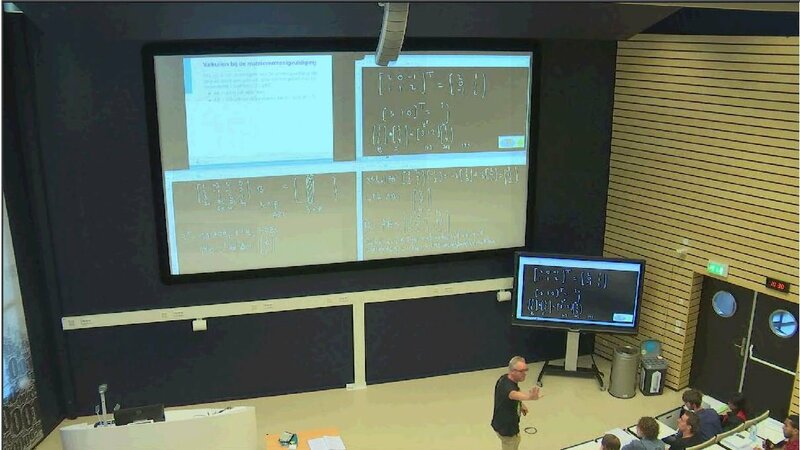 Both lecturers and students are enthusiastic and prefer the SMARTboard with four quadrants over the old-fashioned chalkboard. 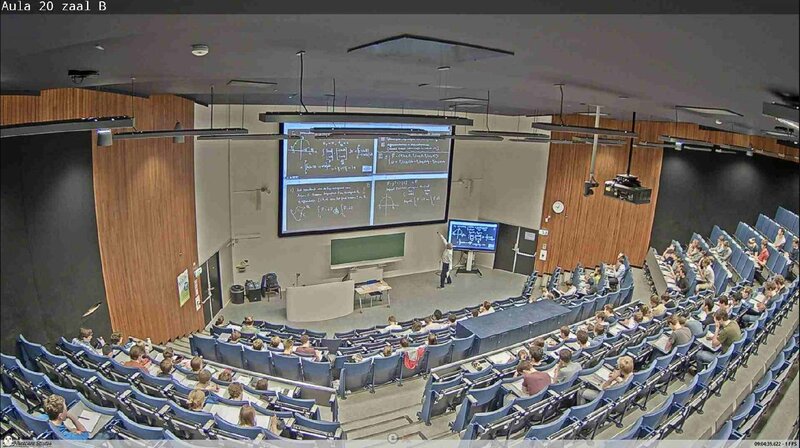 Such encourages us to provide more lecture halls with a similar system. Snel en gecontroleerd de tentamenzaal betreden! Het tentamenbeleid van de TU Delft is herzien. 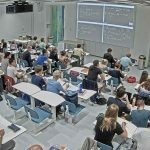 Per 1 januari 2014 kunnen studenten alleen deelnemen aan een tentamen wanneer ze zich hebben aangemeld in OSIRIS, waarvoor een geldige inschrijving aan de TU Delft nodig is. Zij krijgen dan ook alleen toegang tot de tentamenzaal met een papieren aanmeldbewijs of met een virtueel aantoonbaar aanmeldbewijs op hun smartphone. Het controleren van de aanmeldbewijzen kost echter veel tijd. 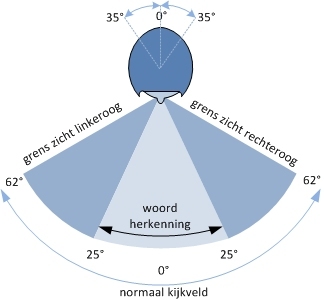 De zaaldeuren van de tentamenruimte gaan tenslotte pas 15 minuten voor aanvang open, zodat een vlotte toegang bij grotere zalen niet haalbaar is. 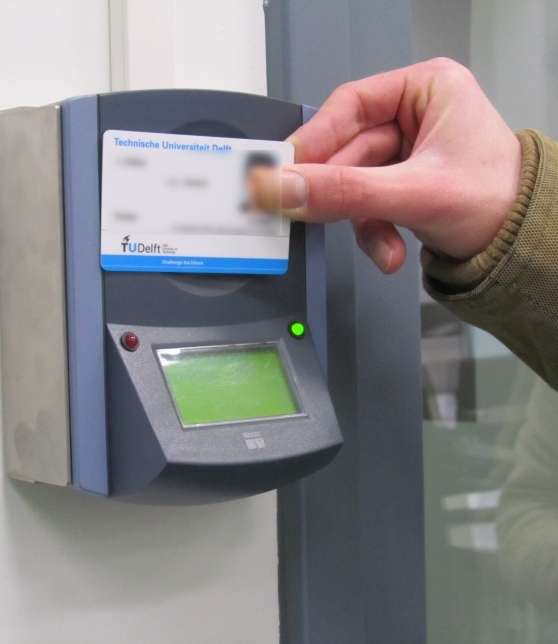 Om de surveillanten bij te staan, is gezocht naar technologie om dat controleproces te automatiseren. In plaats van het tonen van een aanmeldbewijs is het nu mogelijk om de campuskaart te scannen voor toegang tot de zaal. Klik hier voor een kleine videoimpressie. In het document “Evaluatie en Adviesrapport Wand- en Handreaders voor Zaaltoegang Registratie Systeem” wordt het pilotproject uitgebreid beschreven. 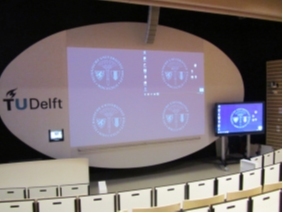 In het voorjaar van 2012 is een pilotproject gestart aan de TU Delft waarbij een digitaal krijtbord wordt gecombineerd met een geïntegreerde AV-IT installatie. Zo werd het mogelijk om verschillende computerapplicaties en virtueel krijt tegelijkertijd te projecteren op een groot scherm verdeeld in vier kwadranten. Bij het doceren van technisch-wetenschappelijke vakken in het hoger onderwijs wordt nog steeds veel gebruik gemaakt van het krijtbord. Onze docenten gebruiken in toenemende mate Informatie en Communicatie Technologie (ICT) en computerapplicaties bij het geven van hun colleges. 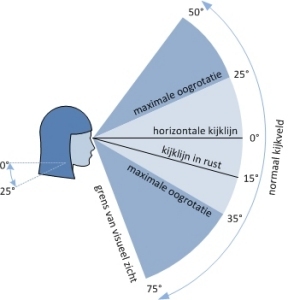 Bij het outilleren van collegezalen (nieuw of gerenoveerd) is het van belang dat, gelet op genoemde didactische gegevens, gezocht wordt naar een opstelling waarbij de docent op overzichtelijke wijze parallel gebruik kan maken van een schrijfbord enerzijds en ICT anderzijds. In het document “Doceren met SMARTboard en vier kwadranten” wordt het pilotproject beschreven en zijn de resultaten van tot nu toe 383 ingevulde enquêteformulieren opgenomen. 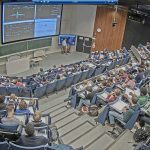 Tevens zijn 193 door studenten gemaakte opmerkingen verwerkt en opgenomen. Een korte impressie is te zien in video1 en video2. 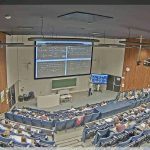 Wat weet u van leesbaarheid in de collegezaal? 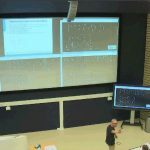 Uitgangspunt in de collegezaal is dat informatie gemakkelijk te produceren, te lezen en te volgen moet zijn. Daarbij mag het niet uitmaken of het op een krijtbord of whiteboard geschreven is of dat het elektronisch geschreven en getoond wordt. 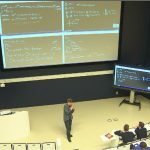 De leesbaarheid van geschreven en gepresenteerde tekst in een collegezaal is afhankelijk van meerdere factoren, zoals zichtlijnen, kijkafstand, stokhoogte van karakters, kijkhoek, scherm en licht.